When you're a sports fan, there's nothing worse than seeing your team lose. Unless of course you're an Irish fan, when there's nothing worse than seeing your team lose to England. Now take those bad feelings and multiply them by the correct amounts that allow for losing, to England, at home, by a lot, when all the form and common sense pointed to at very least a narrow victory, and you have a sense of where we all were this Monday morning. And the journey from the full time whistle to here was far from easy. We all know someone who would call themselves a ‘casual Irish fan’ despite the fact that they never say a word about rugby until we lose when all of a sudden they reveal they ‘saw this coming all along’. Not reacting too strongly either in person or on social media can be a tremendous act of personal achievement, and thankfully I just about managed it. What that profound disappointment can also do to us is hide all traces of mitigation. Hours can become days when our head space is taken up with either anything we can think of to make us forget rugby, or instead the assumption that everything we saw was an absolute disaster. But here's the thing...over in Carton House, Joe Schmidt will be watching back over these 80 minutes again with his entire squad plus coaches. So there can be no avoidance for them. And I very much doubt they're going to be sitting there with a view to beating themselves up over what went wrong, because there's another battle to be fought in Edinburgh next Saturday. So I suppose what I'm trying to say is that by all means criticise because there's plenty in Ireland's display that deserves it. But if that's ALL you have to offer about what happened at the Aviva Stadium, then you best ‘jog on’ as far as I'm concerned. England won because they weren't just well prepared to play test rugby, they were well prepared to play ‘Schmidt-ball’ test rugby. And it's not like they hid their light under a bushel about it either; look who their head coach is. We knew they'd have a plan, which made it all about what we'd do to counter, and the full-time result was a more than fair reflection of how that went for us. 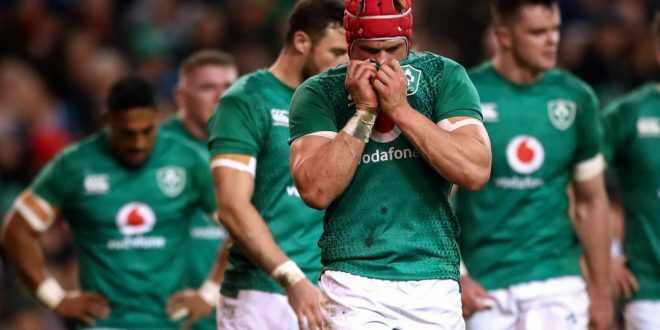 If you've followed this Irish team in recent years yet somehow missed Saturday evening's action, a lot of the stats taken on their own would have you presuming Ireland won. 60% possession. Just 4 penalties conceded, zero cards. 11 from 12 lineouts won. Better tackles made percentage than our opponents. All good numbers within the high standards Joe sets and all in his favourite areas. Then you look at the English tries...a risky decision from Keith Earls went wrong and led to the first. A freakish bounce of the ball stymied Jacob Stockdale and led to the second. A clear forward pass that wasn't even looked at, despite the TMO being consulted for something else, led to the third. And finally an interception try, which was always on the cards when we were chasing the game, was how the visitors got a bonus point that seemed anything but possible at kickoff time. Of course I have my industrial strength green goggles on when I offer those descriptions of the four English scores, yet I still stand by them, although not without offering this caveat. Despite the considerable 'rubs of the green' afforded to our visitors in each case, they were thoroughly deserved. Looking back over the match (painfully) a second time, that opening try after two minutes looked like Jones & co had begun planning it all the way back at the full time whistle at Twickers last St Patrick's Day. The long throw of a lineout bringing Manu into the action at the earliest available opportunity. The 8 tidy phases before a blistering thread-needle pass from Farrell that evaded Earls and left him for dead allowing May in the corner. Yet the alarm bells were far from ringing for us even at that stage. Many's the time I have watched both Leinster and Ireland concede the first score of a match before we had even had so much as one carry of the ball ourselves in an attacking position. Gradually we eased ourselves into some spells of possession before getting our duck egg off the board thanks to a Sexton penalty. But the English were far from done with their masterplan. They knew they couldn't afford to let us even think we could settle on the ball so it was time to crank up the intensity. And they did so to the extent whereby a late hit by Tom Curry on Keith Earls saw the openside sent to the naughty step. Warning : I'm about to have my first proper cut at referee Jérôme Garcès. I give a warning because there is a body of opinion out there that suggests bashing the ref somehow represents an avoidance of responsibility. I try not to see it as a two-headed coin myself. Basically if Curry's challenge on Earls was a straight yellow, then so was Itoje's minutes later. I have to say all credit to Owen Farrell for his heads up thinking when he tried to get the ref's mind on the subject of Conor Murray’s block of the high kick, and perhaps Rory Best could have been more insistent that the TMO be involved, but this was a case of an official having too much faith in his first look at an incident. My ‘hot take’ is that he was inclined not to check because he had already issued a card. Now before I go on, please be clear that even had we two extra men on the park there was no guarantee we'd score. I have already said more than once that the right team won. But this non-call certainly didn't help us and it wasn't to be the last. The sequences when we had the ball grew more fascinating each time. Try as we might to get our ‘Phase Train’ rolling forward, the English defence would be there in just the right amount of numbers to stop us. But we weren't letting up, so much so that when faced with another chance for three points right after Curry returned to the field, we were so determined to impose ourselves that we opted for a kick to the corner. In the series of phases that followed on the English line, Cian Healy was credited with a try that edged us in front. I say ‘was credited’ because again the referee chose not to check with the TMO to confirm that there wasn't a hand under the ball. Then again, there was a penalty advantage for ‘hands in the ruck’ in that sequence of phases leading up to the score which would have him under pressure to go to his pocket so while they don't exactly cancel each other out, they still give oxygen to the speculation that Garcès had a bad day. Unfortunately for Ireland the lead wasn't to last for long, as the English moved to another part of their multi-pronged approach; test Robbie Henshaw at 15 to the fullest. There was many a head scratch over his selection there, though I was excited about the possibility of his being an added attacking threat from deep. But although he has played there before, and indeed many called for him to play there instead of Kearney when Joe first started using him at 12, where he really had his work cut out was being the same ‘safe pair of hands’ at the back the way Rob is. Given our defensive tendency is to go for line speed, it made sense to dink the odd kick into the space behind for our full back to deal with anyway, but here it made even more, and when Henshaw skewed a clearance off his left boot giving England an attacking lineout at our 22, Kearney's absence was made even more telling. Few could blame the visitors for trying another kick on the very next play, and while it looked to all intents and purposes that Jacob Stockdale was in a position to tidy the situation, a crazy bounce took it out of his reach and good support play from both Jack Nowell and Henry Slade led to the latter getting the score. So now it was 10-14 and clearly we had a game on our hands. It's for the next half hour of play that we have to put aside all thoughts that we were never in this contest because that simply is not the case. England did keep us under pressure for the ten minutes leading up to the break but our defence was doing well to keep them out with only a slightly harsh ‘not straight’ lineout dart call against Rory Best (our one and only set piece blip) keeping them in our 22 and eventually they had to make do with three points and a halftime lead of seven. I tweeted during the interval that I was confident we'd be able to make the right changes. As it turned out, while we were doing plenty to get us into good positions, a combination of England's blistering line speed and our own lack of accuracy (even Conor Murray's box kicking radar was thrown off kilter and it takes a lot to do that) meant five and seven pointers remained beyond us. So while we did win the third quarter 3-0, we were still chasing the game going into the final one and the longer time went on the easier it was to make mistakes. One fair comment I did read online after the match pointed out that not one of our players seemed to outplay their opposite number. And even our best performer on the day IMO, namely Garry Ringrose, found himself involved in the next two English scores that killed this contest stone dead. Again we were struggling to stay ahead of their line speed when Ringrose fumbled the ball just inside the English half, and it was here that the game's most controversial incident took place. I have heard all the arguments and seen all the videos with gridlines that suggest while a rugby pass delivered on the run might look forward, because of some kind of nerdy physics apparently, it's not actually so. Call me stubborn but I call 'BS' to that whether it affects my team positively or not. The ‘beauty’ of this incident is that there are no need for artificial graphics on the footage as the halfway line does all the work for us. Slade lets go of the ball ahead of it, May collects it on the other. Forward pass. While this is going on, Garces, to be fair, is in a good position to see and make a determination for himself. But if he was reluctant to award a second yellow because it was such an important occasion, would it not also make sense to make sure he was right about this pass? Especially since he was already asking the TMO to check if Slade was ahead of May's kick forward? OK that's enough harping on that. It wasn't called and if you accept the pass was kosher, then overall it was an incredibly well worked try which was born from solid midfield defence. Even at that stage we weren't totally out of it but when Ringrose found himself isolated a few minutes later, it gave Farrell the chance to make up for an earlier penalty miss from an easier range and he thumped it over ahich meant the result was pretty much done and dusted. Yet still we pressed on, and with the bonus point system in operation these days, we had to keep going for scores to at least get within seven before the end. So with the English tails up it wasn't much surprise that they kept the defensive pressure up enough for Slade to pinch a Sexton pass. What made this bonus point try as freakish as the others was the way the Exeter Centre somehow managed to avoid the knock on. An extraordinary piece of athleticism and control, and given it was his second try of the evening, few would have argued if he had been named man of the match. But when you appreciate that it was the intensity and ferocity of the English defence that did most of the damage, a quick look at the stats sheet explains how the award went to Mako Vunipola who was credited with a whopping 27 tackles. Flanker Mark Wilson got the same amount but the prop most likely edged it for several hard yards made with the ball throughout as well. I'm not so sure the word ‘consolation’ can be used to describe John Cooney's late try, even if it was his first in test rugby and apparently helped us maintain our position at 2 on the world ranking. Going back to the ref for a moment, there were many other head-scratching moments from Garcès throughout, like a curious ‘talking to’ given to (an uncharacteristically subdued) O’Mahony and Sinckler, or the awarding of a scrum to England as the ‘attacking team’ despite the fact that we were the last ones in possession. But none of that can take away from the overall narrative of this match. We may not have been outclassed as some have suggested, but we were definitely out-thought and out-muscled, and that is what we must bring forward. Once you allow yourself to examine the cloud from this match, you can definitely see silver linings. A second Grand Slam would of course have been awesome, but it would also have made the target on our backs even bigger for the World Cup. And while many have pointed out that “we don't begin tournaments well under Joe”, this match plus Paris last year support that theory but when it's time to face Scotland in our first pool match over in Japan, we at least know Joe will have had his squad all to himself for several weeks leading up to it. Later this week we'll have a guest post from Keego plus the return of Mark Jackson's Six Nations Team Of The Round on Tuesday, Harpin Points on Wednesday, Telly post on Thursday and our Scotland v Ireland preview on Friday. Plus of course every morning our Front5 quotes & links. Do stay tuned!